Something rather remarkable occurred in the Yorkshire Dales over the weekend. John and I got bitten. Not by the midges (and there were plenty of those) but by the camping bug. I've always said I don't mind camping, but, if there's a choice, I'll take walls and a roof over canvas any day. (I should point out that we haven't camped in 15 years, not since we slept in a tiny two man tent on someone's farm in Cornwall to watch the eclipse in August 1999.) But we had such a wonderful weekend with our friends, on a really lovely campsite near Pateley Bridge, that we thought hmm, maybe we can do camping after all. Maybe all our pro-camping friends are onto something. When we arrived on Saturday lunchtime is was raining a little and it was all rather cold and bleak, with that kind of heavy, grey sky I dislike so much. We weren't thrilled, to be honest, and I was glad we had no tent to put up, as we were sleeping in a "pod". It's a fabulous idea. Small and basic inside, with two single bed frames and room for a double mattress, it has electricity*, a kettle and a useful things like a water canister, picnic bench and fire pit. You bring your own mattresses and bedding, and I wasted no time making it look pretty. It was comforting to know that, no matter how much it might rain outside, we would be snug. After a cup of tea we walked down to the river that runs through the campsite and spent a while down there. I say a while but it was all afternoon, I think. Time seemed to stand still. We were a large party, about 20 adults and 20 children, all families we've known for years. We met through the NCT when all our eldest children were babies or toddlers and, 8 years on, still like each other. 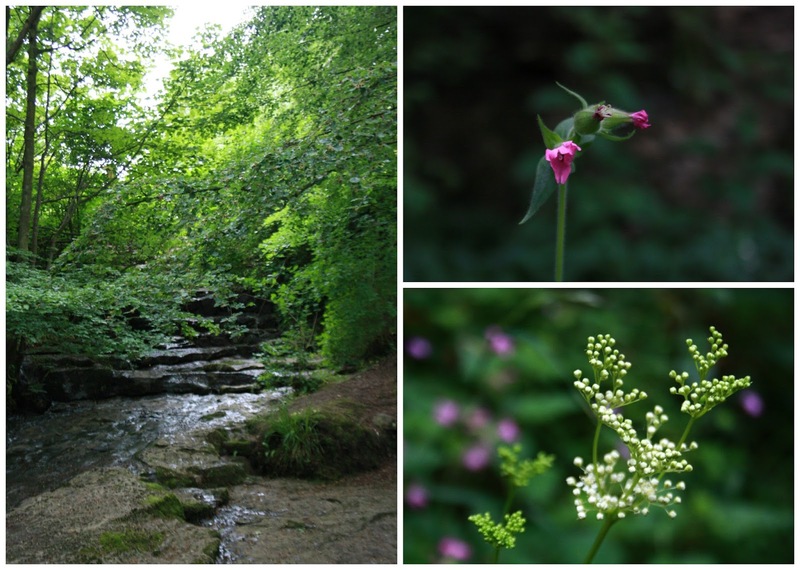 It was so gloomy down there, with no sunlight to filter through the trees, and it was all very lush and still. Beautiful wildflowers were everywhere you looked. There was a lot of clambering and paddling fun to be had in the (cold) water. A lot of the kids were in wetsuits and were having a great time. Bella, like me, preferred to watch from the riverbank. The clouds parted as the evening wore on and we lit the barbecue and opened the wine. The kids finally went to bed very late - I've actually no idea when, time just seems to pass when you're camping with no routine to ground you - but not until they'd listened to stories around the campfire. We all sat outside until even later. It was pretty cold and I was glad of the fires. I mean, how can you not be happy and glad to be alive when you see those hills, the spectacular beauty of the Yorkshire Dales, and that blue sky. Nothing more to think about than the task in front of you. Boil kettle. Find mugs, Make coffee. We had breakfast (rolls, butter and jam because it was easy) and I was glad I'd remembered the cafetiere. And I think it was at about that moment that I had my mini-epiphany and thought that, actually, me and camping might be friends after all. *Although there is electricity there is no wifi, which was fine with me. Also, since it's in the middle of nowhere, there is no phone signal either! I feel like I've begun all my recent Friday Happies posts with a kind of frantic, breathless feel, like I'm racing headlong into the weekend, anxious and overstretched. Not today. We're all busy aren't we, but tonight I feel calm and happy. Peaceful. I really wanted to thank you for your comments on my Midsummer post, in which I had a little sulk about the perceived boringness of my life. You caught me in a vulnerable mood. I normally couldn't care less what everyone else is up to and I let the trendiness wash over me. I truly love the everyday, the little things, and tonight that's what I'm celebrating. 1. The way these hot pink fushias look against our grey front door. I have three terracotta pots in a row and they've gone mad, bursting forth and overflowing, pink cascading everywhere. I love to see these flowers as I walk up the steps and I always pause to admire then while rummaging in my bag for my keys. 2. Summer evenings. Pinky-peach fluffy clouds spotted while doing the washing up at 9pm. 3. Mid week drinks with the very best sort of friends. The kind you can cackle with. A cold bottle of beer with a lime in it, drunk in a pub beer garden with a view, on a night when it was just warm enough to sit outside. 4. Baking. A batch of Oreo brownies (just regular brownies with some crushed Oreo buscuits scattered on top before they go in the oven) and some flapjacks, for the weekend. I've not done any baking for the last couple of weeks and I'd forgotten how much sweet pleasure there is to be had in weighing and mixing things, then putting them in the oven and 20 minutes later taking out something totally delicious. Plus the house smells fantastic too. Baking is good for the soul, don't you think? I wish you all a lovely weekend. We are camping in the Dales tomorrow! Well, when I say camping, we're staying in a "pod" (which is basically a fancy shed) but it involves inflatable mattresses and sleeping bags and campfires, and that's about as close to camping as I'm ever likely to get. I'm really excited. I just hope the rain stops. It's funny how, on seeing the cakes, I am straight away transported back to the special day, to a certain mood or feeling - usually panic. 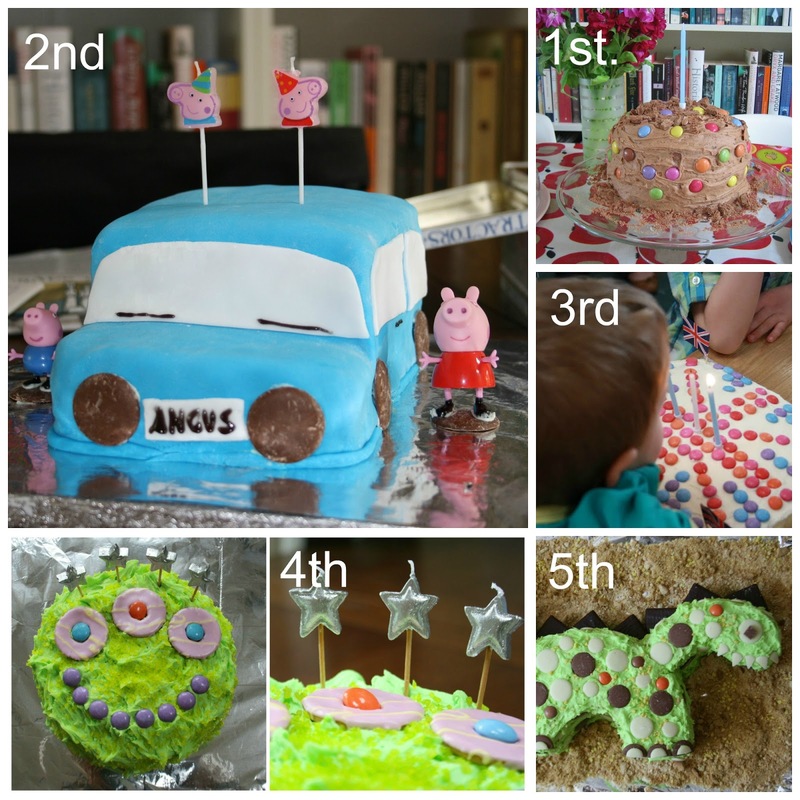 In amongst the lurid greens and unnaturally bright blues we have a round chocolate cake for Angus's first birthday, followed by a Peppa Pig car (we were deep into the Peppa Pig phase in that year I seem to remember), a union flag, a green monster and a dinosaur this year for his fifth. I still shudder when I look at that car. I was in my "I can do fondant icing, oh yes I can" phase. I can't. I hate the stuff, to work with and to eat. It tastes like plastic. Now buttercream, oh yes, buttercream I love. To work with and to eat. And for Bella...well, there appears to be a lot of pink there. Hmmm. There seems to be a clear gender divide going on in these photos. In my defence, if you ask a four year old girl what kind of birthday cake she would like she is probably more likely to say pink castle than green three eyed monster. So we have here a sensible round cake for Bella's second birthday, a train for her third and then I lost my mind and made her a castle for her fourth. That bloody castle very nearly killed me off. Under the turrets (shop bought swiss roll with ice cream cones on top) were seven layers of badly dyed rainbow sponge. I don't know what I was thinking. It was SO heavy, and it snowed on the day of her party and I remember the car sliding around on the way to the soft play centre we'd booked, and me sitting in the passenger seat with the cake on my lap just thinking "please let us and the cake get there in one piece..." We did, and I came down with the flu the next day. This is what photos look like pre-blogging! For her fifth, a butterfly. That photo was taken on my phone just before we left for the party. I don't think I took a proper photo of it, I was probably too busy flapping. For her fifth birthday party, my friend Kate and I had hired a church hall and planned a joint party for Bella and Kate's son Sam. The bouncy castle we'd booked was half an hour late. The children's entertainer didn't turn up. It might be one of the most stressful experiences of my life. Kate and I had to do the "entertainment" for about 45 children. Hideous, just hideous. I remember Kate shaking afterwards in the kitchen saying "I need a bloody drink". Anyway, I digress. The following two cakes are much more tasteful. There is still a lot of pink going on, but I remember thinking that her sixth and seventh birthday cakes were actually enjoyable to make. You may notice that Smarties are my decorating tool of choice! They're just so perfectly rainbowy, and sorting them into little bowls of individual colours is excellent de-stressing behaviour right before hosting a party. But I've not mentioned the most special part of a birthday cake. The candles. A cake is not a birthday cake without them. For the memories of a toddler to small to blow them out, who just spits all over the cake in their exuberant efforts instead; for the memories of a group of six year olds singing Happy Birthday To You out of tune; for the memories of "make a wish!" and of matches and cameras that are nowhere to be found at the crucial moment - that is why I love birthday cakes so much. They are part of the fabric of family life, part of the patchwork quilt of memories made and photographs taken. So our birthdays are as much about sparkle as they are colour. Birthdays are for celebration, for light and glitter, gold and silver, flickering and warm. 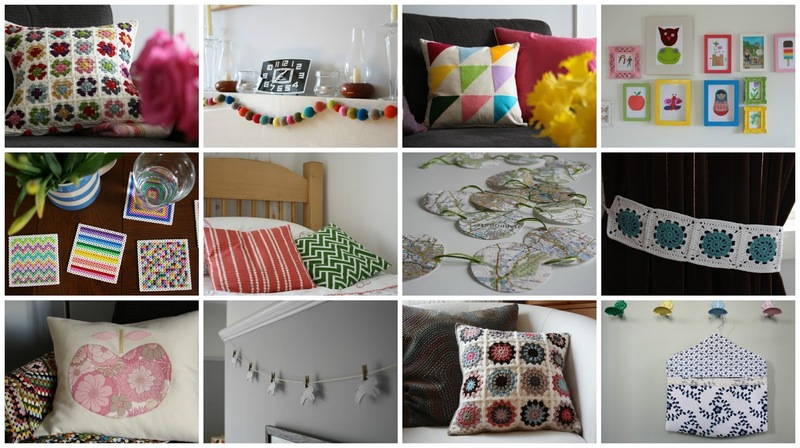 Happy first birthday to the Colour Collaborative! It's been a joy working alongside these talented bloggers for the last year. Most prompts I've loved, some have been work hard, some have been very last minute, but it's always been rewarding and, more importantly, enjoyable. Many happy returns, ladies. If you'd like to read the birthday posts by the other Colour Collaborative bloggers, please follow the links below. Not all posts may be up just yet. *I did, bar one. I cannot find a single photo of Bella's first birthday cake. That's really annoying, as I seems we took about 10,000 photos in Bella's first year. 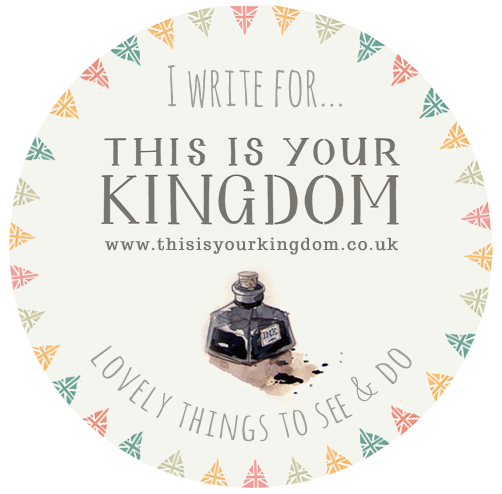 I am very excited to be taking part in an around the world blog hop today. I had the privilege of being invited twice, by Kate from Just Pootling and Sarah from A Little Happy Place. Thank you ladies, very much. I will answer four questions about what I make and why, and then pass the baton on to two more bloggers at the end. So, to answer the first question, what am I working on? A blanket. (I've written about it here and here before.) I started it in August last year and I would like to finish it this summer. Maybe. This is the first really large blanket I've made and I do find it hard to keep the momentum going, I have to admit. It did me good to get out my blanket basket yesterday and lay out the completed squares, just to remind myself of how much I've actually done. I've finished 140 squares. When I say finished, I mean finished, ends darned in and everything. I want the blanket to be big enough for a king size bed which means I need 225 of these in total, so that I have a 15 x 15 square. I have another 20 almost done, but that still leaves 65. Yes, 65 flipping squares... I am worried that the overall use of colour is too dark, and want to make sure the remaining squares have very bright or pastel third rounds. Only one project on the go, that doesn't seem right, does it? But I've learnt over the years that too many works in progress annoy me. I'd rather unravel something than have it sitting in my project basket, taunting me. I do have three other projects which I have mentally committed to, but not begun yet, if that makes sense: a child's t-shirt with a monkey appliqued on it, ordered by a mum at school; a whole bundle of crocheted cotton face cloths - some will be given as teacher gifts, with a nice bar of soap, others will be donated to a stall at the school summer fair; a summer embroidery hoop, to complete my seasonal embroideries. Honestly, I don't really know, I'm not sure that I sit in any genre. I can crochet, knit and sew, but would say that embroidery or hand sewing and crochet are my strongest areas, and the crafts I take most pleasure in. Knitting does not come easily to me, but I persevere. Likewise, machine sewing is the least relaxing thing ever, but I love what can be achieved with it. 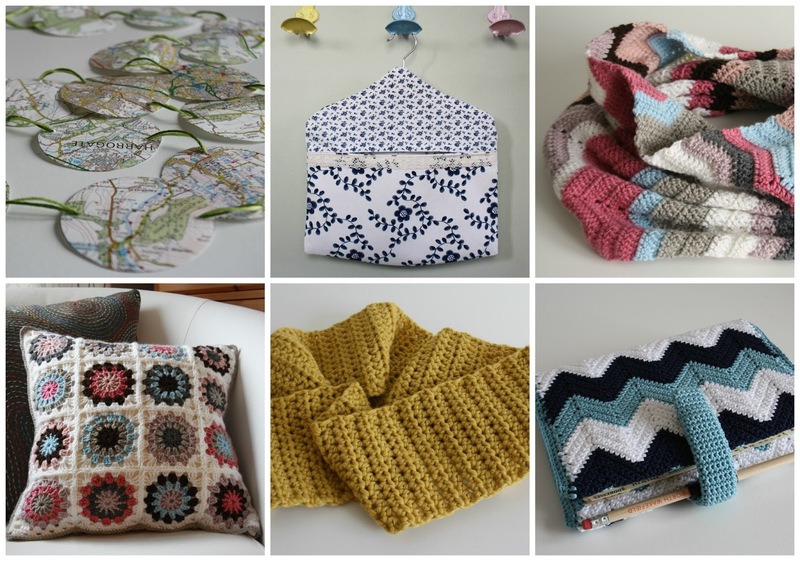 When I look back over what I've made this year I see crochet, zigzags, items to be worn, items for the home, items to be used - but maybe there is a muted palate in there which are "my" colours. I would say that the things I make are mine and, while I might use patterns by other people, or draw influence from other things I've seen, my choice of colours or yarn or fabric will always make it slightly different, will make it my own. I am often frustrated by the overly fussy, feminine look of so much handmade work, and the things I find most inspiring are when someone has taken an old craft but made something really modern and fresh with it. For three reasons: to relax, to save money, and to decorate the house. I find having a project in my hands while I'm watching tv or listening to the radio enormously relaxing. It just soothes me. I think it's good to have different projects for different moods. Clearly, when I'm in relaxing mode, I don't want anything that requires too much concentration, just something I can half concentrate on. This throw was just that kind of project. Last Christmas we were watching our pennies very closely and so I set out to make as many Christmas presents as I could. Some of them are shown in the image below. A couple were tricky and time consuming, many pushed me out of my comfort zone, but we spent a fraction of what we normally would on presents last year. If you have the time, then making your own gifts can be cheaper. Although take care not to use very expensive yarns and fabrics if you want to save money! I've always loved interior design and playing around with colour and pattern in the home is just another kind of crafting to me. I want to make our home look as nice as it can. It has to work hard - it's a three-bed semi with zero kerb appeal and not a lot of space, but that just makes it all the more challenging and all the more rewarding. I'm a bit of a magpie. I'll see something in a book or magazine, or on a blog or pinterest, and stash that idea away. It might be a whole project, like a quilt or cowl, or it might be the gilmmer of a beginning of an idea, just a sense that I like a certain colour or the way it was made. I'll jot it down in my notebook and I might start it the next day, or I might think about it for a year. Currently, I am very keen indeed on making a hexie, or English paper piecing, style quilt. I want it to be very mis-matched and homely looking, but I need to make sure that my choice of fabric and colour stop it being too shabby chic, too country in style, but keep it lighter and fresher. I have a huge stash of fabrics in small amounts, and I think this project would be an excellent way to use up some of that fabric. 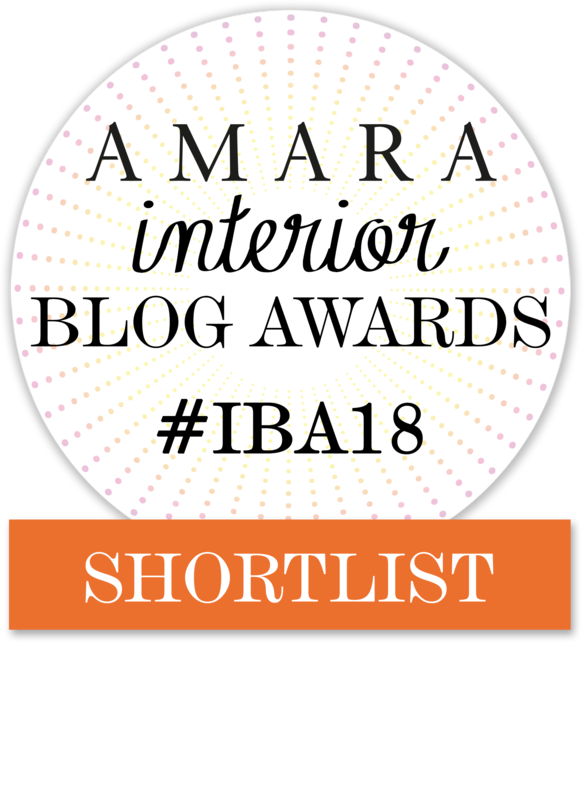 So, now I must pass on the blogging baton and I am nominating two bloggers, both of whom will be posting their blog hop posts next Monday, the 30th June. Jennifer, of Thistlebear, lives in New Mexico with her husband and children. I like to think we'll meet up some day as she is a kindred spirit. 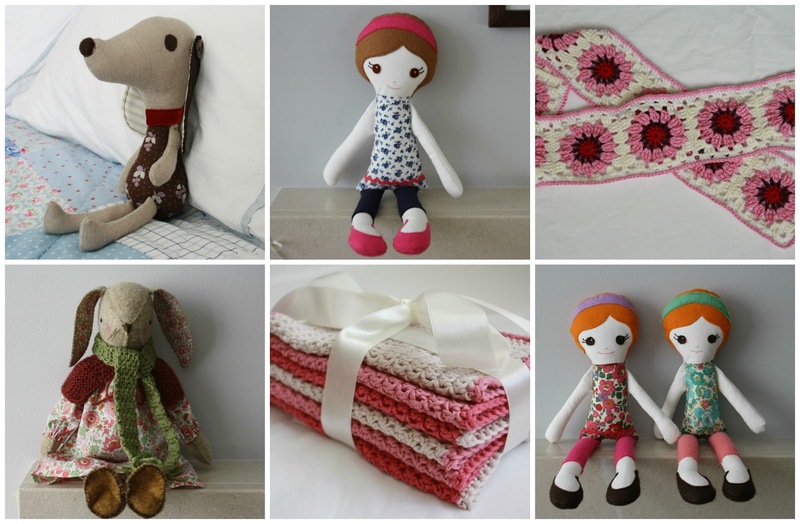 Her passions include homemaking, crochet, cooking, sewing and photography. She has chickens and she lives in the dessert and drinks possibly as many cups of tea a day as I do. Col, of Hello Olive. lives in South Africa with her husband and two young sons. We've been blogging buddies for as long as I can remember and I always admire her style and eye for excellent design. She spent some time living in Scotland before recently moving back to Cape Town where she balances motherhood with her graphic design work. Her style is colourful and fresh, with strong mid-century influences and you can see her Etsy shop here and her Society6 shop here. Do you ever feel that your life is really inadequate and dull? Not blog-worthy? I sometimes do. I was so preoccupied with life last week that I kind of forgot it was midsummer. I sometimes make a Swedish summer cake with custard and strawberries, but since it was just Angus and I, and he doesn't like strawberries and I'm on a diet, it hardly seemed worth it. So, with John working late shifts and Bella away, it was just the two of us, pottering around together. He did not stop talking all weekend. Chatter, questions, thoughts, more questions. One child is easier - less toys out, less mess, less juggling, less of the two children talking at you at exactly the same time, both wanting instant answers. One child is also harder - no playmate, no one to go off and build dens with, just Mummy as the source of all entertainment and conversation. So there was no Midsummer barbecue, drinks with friends, none of that. The trouble with blogland and Instragram is that, if you're not careful, you can feel that EVERYONE but you is having an amazing time in their amazing campervan/yurt/allotment/garden/park at a lovely event with golden setting sun, wildflower posies, organic sausages, bunting, cocktails in jam jars (Why the jam jars? What's that about?) while you are lying on the sofa watching The Good Wife in your tracksuit bottoms. So what did we do? On Saturday I had a very nice pub lunch with my friend Kate while Angus played at a friend's house. It was extra lovely for the absence of little people; it felt a bit naughty, like we were bunking off. Three hours of Saturday afternoon were stolen by the ironing pile but, just for a day, that ironing basket is empty which makes me feel that I'm doing something right and gives me a nice smug feeling. I was slack about bedtime and let Angus play for much longer than usual while I sat in the garden enjoying the evening sun and taking photos of the flowers. We spent this morning in the garden, pottering and tidying up. I picked some flowers (sparingly - we don't have many!) and put them in a jam jar. Yes, a jam jar. They are for jam and flowers, not cocktails. Then, when we were finished and scrubbed clean, I put a tablecloth on the outdoor table, plonked the flowers down on the table, and Angus and I had lunch out there. Nothing fancy - chicken salad for me, cheese and crackers for him - but I needed to feel like I'd made an effort, done something celebratory. Then we got the bus into town (we got the best seats - top deck, right at the front) and went to the Lego shop then had coffee and cake. And now I'm sitting here taking stock of my weekend and thinking that it wasn't so bad, and now Bella is home from Brownie Camp (suntanned and filthy, she loved it) and John is home from work, now that I have my favourite people all around me - it all feels right in my little corner of the world.